Ocimum tenuiflorum is closely related to culinary basil (Ocimum basilicum), but differs in being a short-lived perennial with smaller flowers. Commonly known as holy basil or tulsi and tulasi in South Asia, it is an important sacred plant in Hinduism and, as with many plant species used in Asia, the religious uses are often linked with the medicinal uses. Historically, holy basil was frequently grown in large vessels in the courtyards of Hindu forts and temples to cleanse the body. One of the plant’s synonyms, Ocimum sanctum, reflects this religious connection. Holy basil is an aromatic, perennial herb up to 1 m tall, sometimes purplish in colour. The leaves are elliptic (narrow oval) in shape. The fruits have four small brown nutlets, which, unlike basil, do not produce a lot of mucilage when wet. 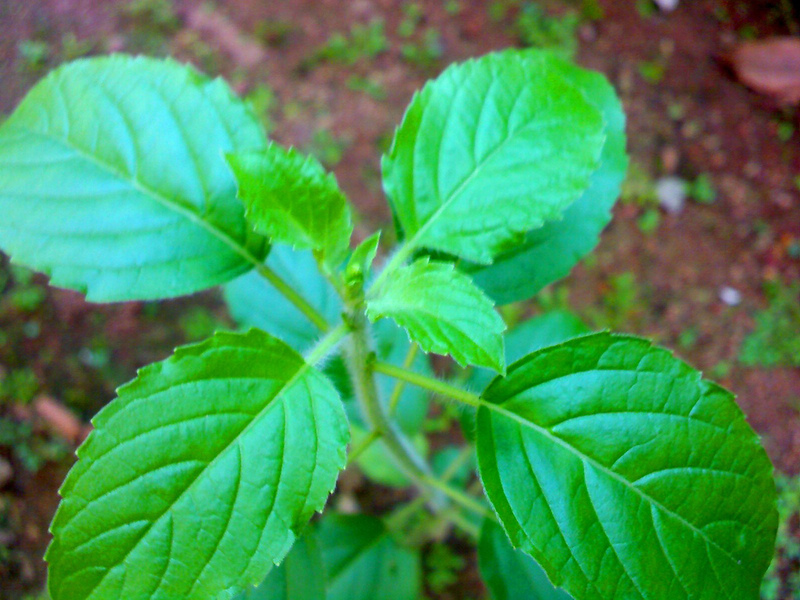 Regarded as sacred in Hinduism, Ocimum tenuiflorum has many traditional medicinal uses. A mixture of leaves and seeds, with black pepper (Piper nigrum) is given to pregnant women suffering from malaria. Fresh flowers are used to treat coughs and colds. The plant has shown promise in clinical trials in alleviating hepatic dysfunction, and is an ingredient of pills and ointment to cure eczema. The essential oil from some populations of holy basil contains high levels of eugenol. In traditional Thai medicine, the leaf or whole plant is used to alleviate nausea, vomiting, diarrhoea and flatulence. Alcohol extracts from the plant heal peptic ulcers. The leaf extract is effective in checking the spread of the fungal pathogens Pyricularia oryzae and Rhizoctonia solani, which cause blast disease and sheath blight disease of rice. Antibacterial activity and deterrent against the larvae of root knot nematode (Meloidogyne incognita) have been reported, and the oil is a mosquito repellent. Ocimum tenuiflorum is used as a major flavouring ingredient in Thai cuisine. Because it is regarded as sacred in Hinduism, it is used to make rosaries – the woody stems are used to make the beads.